To stand out as a great magician or an expert at any card game, you must create an impression right from the moment you pick the cards up. Unfortunately, some of the players do not know how to shuffle a deck of cards. In order to conjure that professional impression in people’s minds, you have to master several ways of shuffling cards. As you may be aware, there are several ways that may be used to shuffle cards today. Discussed below are three of the coolest ways to shuffle cards. If you aspire to would like to shuffle your cards like a pro, this guide will help you master the Riffle, Hindu and Overhand shuffling methods. This is one of the simplest and commonest cool ways of shuffling cards today. 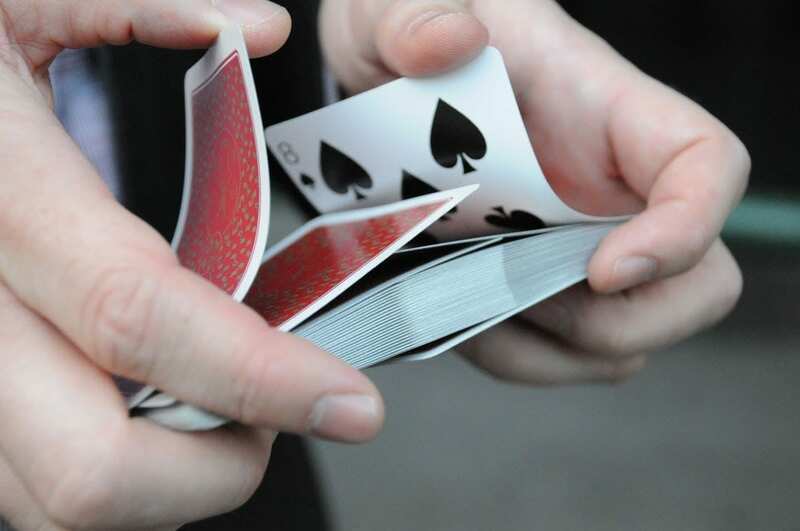 To carry out the overhand shuffle, you need to hold the cards in your dominant hand—in a horizontal position. You need to hold the deck of cards in such a way that the pinky, middle and ring fingers are positioned on the sides of the card and facing away from your body. You should now position the thumb on the end of the cards that is closest to your body. This will leave the index finger to support the top of your deck of cards. At this point, you need to position the bottom edge of the deck of cards on your other palm. While doing this, you should ensure that the cards in the deck are well aligned. While placing the free thumb on the top of the deck’s front, lift about half of the cards in the deck from the back. While doing this, the thumb should just be pushing gently against the deck and ready to move away. You should then release a part of the deck you lifted onto the front side of the deck. While doing this, you must ensure that you move the free thumb away, just as this portion of the deck comes down. You should then spring the thumb back in a way that pushes this portion of the deck downwards. You should then lift the remaining cards and bring it down onto the front side of the deck. Similarly, you are supposed to lift the free thumb and spring it back as you bring this portion of the deck down. At this point, you are supposed to lift the thumb and lower it to help you guide another portion of the deck down, yet again. You need to carry out this step repeatedly until all the lifted deck is shuffled into your hand. While carrying out this step, it is advisable to have a light touch on the cards rather than gripping them firmly with the shuffling hand. A light touch will allow you to release the palm of the other hand gently. Repeat the above discussed steps several times. In this regard, you should repeat the overhand shuffle until the deck of cards has been reshuffled five to six times. At first, you may be too slow with this method. However, continued practice will help you do it faster and more precisely. This shuffling technique may also be referred to as the leafing or dovetail shuffle. 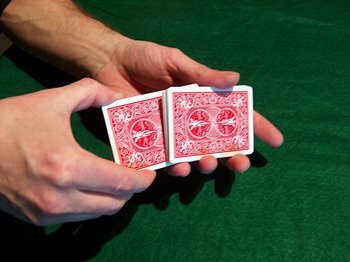 In this technique, half of the deck is basically held in each hand; with the thumbs pointing inwards. First and foremost, you are supposed to split the deck into two halves. Half of the deck should be held lengthwise in the right hand. Similarly, the other half deck should be held lengthwise on the left hand. 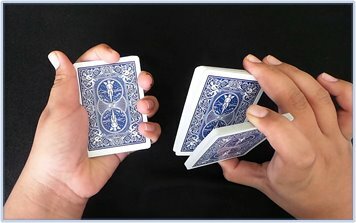 Basically, you are supposed to hold a half of the deck in each hand and then have each of the hands follow the same position. Again, you also need to note that there is a specific way that you are required to grip the cards in your hands. In this regard, you should position the thumb over the top edge and have the ring and middle fingers support the bottom edge of the decks on each hand. You should now place the pinky finger at the back edge of the deck of cards you are holding. Such a grip will leave the index finger on each hand to hover above the deck for support. Alternatively, you can have the index finger go onto the front edge. Now that you have the right grip on your cards, you should bend each of the deck halves gently. To do this, you should use the index fingers and thumbs, along with the hands to bend each half. You only need to bend the decks slightly such that they assume a concave shape—with the middle of the decks bending inwards. Using your thumbs, riffle the decks. 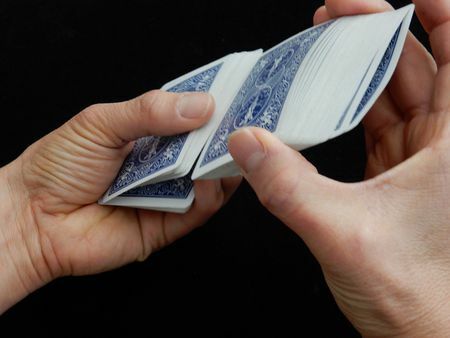 To achieve this, you are supposed to bend the half-decks in each hand backwards a bit more. You should then move the edges of the cards slowly using the thumb. While doing this, the two half-decks are supposed to riffle together and create a shuffle deck. Lastly, you are required to perform a cascade finish. This step requires you to bend the cards towards your body—in a direction opposite to the one they were initially bent. While performing the cascade finish, you are supposed to keep the thumbs on top so as to keep the cards in line. Upon releasing the thumbs, the cards should ‘Cascade’ downwards. If you would like to shuffle your cards even more, you should repeat the riffle shuffle. However, one riffle shuffle is considered to be enough. As such, a second shuffle is entirely optional. This is yet another fascinating method you may use to shuffle cards. Just like the other ways of shuffling cards discussed above, this method requires practice to perfect. Place all the cards in a single deck and then hold the end of the deck using your middle finger and thumb. Now position the thumb and middle finger along the long side of the deck and in opposite sides to each other. Though not necessary, you may also place the index figure lightly on the deck for enhanced support. Now place the deck on the palm of the other hand. You should then use your free hand to grasp the side of the deck lightly. This should be done with the thumb on one side, and the ring and middle fingers on the opposite side. This should leave the index finger sticking out in the front of the deck. While maintaining this grasp, you should pull some cards from the top side of the deck gently. This should be done using the bottom hand. In this regard, you need to use the bottom hand to grab a number of cards (about ten cards) and then leave them on the palm of the other hand. After this, you need to move the deck from your bottom hand. at this point of the shuffling process, you are supposed to move the deck a deck’s length distance from the small stack of cards you picked in step three. While this is a fascinating way of shuffling cards, the Hindu shuffle is not as thorough as the Riffle Shuffle discussed above. As such, you will be required to repeat the shuffle until you have all the cards in your palm. To do this, you need to move the deck back to the palm of the bottom hand and once again take a few cards from the stack. Having taken a few cards, you should move the deck way and later bring it back. This process should be continued until all the cards are in the palm of the bottom hand. For the best results, this shuffle should be carried out a number of times. How well you shuffle cards can tell an observer how experienced you are with the process. If you want to look like a pro, you need to master several card shuffling techniques. While there are numerous card shuffling techniques in use today, the Hindu, Riffle and Overhand shuffle techniques are some of the commonest. While some of these techniques can shuffle the cards thoroughly in a single shuffle, others require you to shuffle repeatedly. As you begin with any of these shuffling techniques, you can expect to be a little slower. However, you can easily perfect the art by practicing your favorite shuffling technique. Regardless of your preferred technique, this guide will help you shuffle cards like a professional.